An Edmonton photographer is sharing snapshots of life with mental illness to tackle the stigma of mental health conditions. Lorna Dancey launched the State of Mind project more than a year ago, photographing volunteers at her home in Edmonton. Dozens of men and women participated, recounting their experiences with depression, anxiety, eating disorders and addiction. “They’re so courageous, sharing their stories,” Dancey said. One in five Canadians will experience a mental illness in their lifetime, according to the Canadian Mental Health Association (CMHA). Katy Winget struggled with addiction and a severe eating disorder for nearly a decade before starting rehab at age 24. She met her husband in the program, with whom she had a daughter on her one-year anniversary of giving up drugs and alcohol. “Drugs and alcohol nearly killed me,” she said. More than a decade later, the two run a tattoo parlour and a mixed martial arts gym in Edmonton. Winget also works full-time as an educational assistant and is the president of her school’s parent council. She had been following Dancey’s work online when friends recommended she participate in the State of Mind project. At first, Winget said she had reservations, fearing parents at her school would judge her harshly. “I actually did have a really hard time with it,” she said about posing for the photos. But the flash of Dancey’s camera burned away those fears. “It was a definite affirmation,” Winget said. As part of her project, Dancey also gave a face to people affected by suicide. Suicide is one of the 10 leading causes of death in the country, according to data gathered by Statistics Canada from 2009 to 2013. 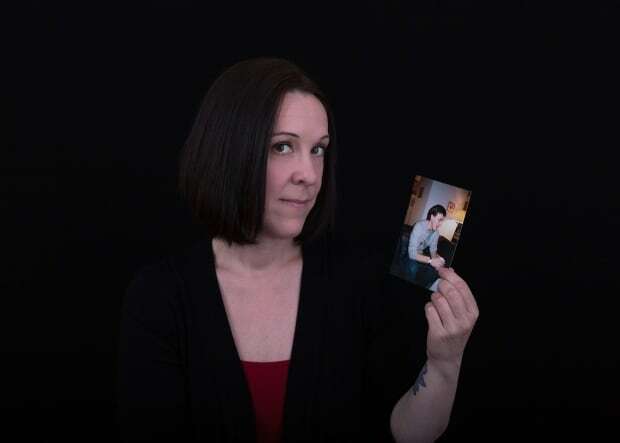 Amanda Adams lost her father, Orson Schwabe, to suicide. When she heard about Dancey’s project, she wanted to share his story. Schwabe suffered from bipolar disorder, an illness characterized by intense mood swings between elation and depression. About one per cent of Canadians are diagnosed with the condition, according to the CMHA. Some days, Adams’ father would be “up” — a whirlwind of jokes, energy and affection. Then he would crash, lying on the couch for days. “It was hard to watch him spiral,” Adams said. Ten years ago, he committed suicide. The stigma around her father’s illness didn’t sink in until she started talking about how he died, Adams said. Adams and Winget are featured in one of 80 photographs on display at Edmonton city hall from May 8 to 15. Dancey said she hopes her exhibit helps end the stigma surrounding people who struggle with mental illness.